This article is about one of the bosses that appeared in Super Mario Bros. 2. For the species, see Fryguy (species). Fryguy (also spelled Fry Guy or FryGuy) is the boss of World 4 in Super Mario Bros. 2. He is a living ball of fire created by Wart in Subcon. Fryguy first appeared in Yume Kōjō: Doki Doki Panic. During the events of Super Mario Bros. 2, Fryguy is stationed in a tall fortress at the end of World 4. Despite Fryguy being a living flame, World 4 is a land of snow, ice, and arctic oceans of Subcon. When confronted by Mario and his friends, Fryguy spits fireballs to attack the heroes. Since Fryguy is made of fire, the heroes take damage if they happen to touch him. To defeat Fryguy, Mushroom Blocks (masks in Yume Kōjō: Doki Doki Panic) must be thrown at the boss. After three hits, Fryguy splits into four Small Fry Guys, which must also be extinguished. He was voiced by Charles Martinet in the Advance version, owing to that version including voice acting for the various boss characters. Between the NES version and later versions, his sprite is heavily redrawn, causing his eyes to become more open, his mask to turn from black to light blue, and his flame arrangement to change. Super Mario Advance changes it further by having his face be a separate graphic from his body. The instruction manual for Super Mario Bros. 2 states that Wart "gave life to this entity," and said that he was "created from fire." In Super Mario Advance, he is shown being created on-screen by four of Wart's giant bubbles; however, instead of fire, the bubbles create him from an empty version of his mask. Fryguy appears once again as a boss in the pseudo-sequel, BS Super Mario USA. He helps Wart and the other 8 bits attack Subcon once more, but is eventually defeated by Mario and the other heroes once again. Like the predecessor, he is found in the snowy lands of Subcon and he is fought in a very similar way to that of Super Mario Bros. 2. Fryguy, as he appeared in The Super Mario Bros. Super Show! Fryguy is a character in The Super Mario Bros. Super Show! Like many enemies on the show, he works for King Koopa, as opposed to Wart (as in the video games). Fryguy does not appear as much as other Super Mario Bros. 2 enemies on the show. Fryguy also appear in the Nintendo Comics System's Mario comics. In the comics, there is not just one Fryguy, but multiple. Instead of being created by magic, these Fryguys are instead created when Mushroom People become engulfed in fire or lava. In one comic story, Duh Stoopid Bomb!, a sole Snifit becomes a super-genius after being exposed to one of Bowser's inventions. This Snifit then performs a coup and takes over Bowser's Castle. After the coup, Bowser is expelled to "Fryguy Kindergarten". Fryguy and some of his GLOM-spawned clones try to attack Mario as he is exploring the Mushroom Kingdom in Double Trouble, but he avoids them. Mario, Luigi, and Yoshi encounter Fryguy in volume 8 of Super Mario-Kun. The Fryguy and his minions attempt to cook them in a soup, but Toad and Birdo arrive by breaking through the sky, riding on a whale. The whale then flattens Fryguy and his minions. 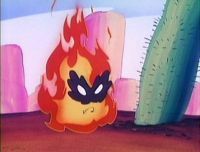 In the Super Mario Bros. film, the flamethrowers used by Koopa and his minions are referred to as "Fryguy Flamethrowers." In Super Mario Bros. & Friends: When I Grow Up, the description of the Firefighter career page reveals that Fryguy has started a fire. This Fryguy lacks a mask, instead having bushy eyebrows. A Sammer Guy in Super Paper Mario is called Guy Who Fry. Hībōbō From hi, fire and bōbō, burning sound. ↑ 1.0 1.1 1.2 "Wart gave life to this entity which is created from fire. He spits fireballs when he is mad." - Super Mario Bros. 2 instruction booklet, page 27 (Fryguy description). ↑ Super Mario Advance instruction booklet, page 34. ↑ Wessel, Craig. Super Mario Advance. Page 92. This page was last edited on March 20, 2019, at 19:03.